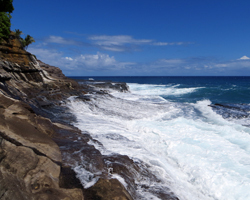 China Walls: A Scenic Hawaii Sightseeing Adventure! If it wasn’t for landmarks like China Walls in the Hawaii Kai area of east Honolulu, it would be easy to forget that Oahu is a volcanic island – built up layer by layer, one lava flow after another, from the ocean floor 6,000 meters/20,000 feet below. Unlike the Big Island of Hawaii, where recent lava flows are visible everywhere, Oahu is a much older island… and it’s more overgrown – with plant life and with people. As a result, many of us don’t see much evidence of Oahu’s eruptive past on a day to day basis. 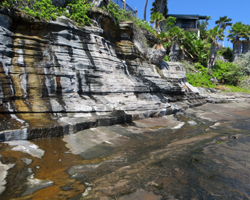 So if you’re interested in geology… or if you just want a nice backdrop for your family Hawaii vacation photo, you might want to make a quick stop at China Walls during your scenic Hawaii sightseeing adventure. Don’t worry… it’s not as boring as I just made it sound. As far as I know, the entire eastern tip of Oahu (where China Walls is located) is the most-recently formed part of the island. A drive through this section of coastline can be quite beautiful if you take the time to appreciate the geologic patterns and formations along the route. In fact, if you’ve ever watched “The Karate Kid Part 2” (I don’t recommend it) or “From Here to Eternity” (the book was okay), you’ve actually already seen this area as the location of the Okinawan temple (doesn’t exist) and the movie poster love scene on the beach. Anyway, my point is that it’s very scenic in this area. 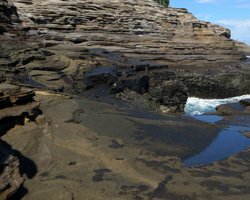 Not only are the various lava flows visible in layers at China Walls – which is visually intriguing in and of itself – this scenic Hawaii attraction also catches the eye because it’s not just plain old black pahoehoe lava (pah-hoy-hoy: smooth lava). Although I wouldn’t go so far as to call it green, it is greenish… a hue caused by the presence of a semi-precious stone called Olivine. Don’t bother bringing your pickaxe, though. You won’t be able to mine anything of any value. Basically, you go to see the colors and textures as they lie. Contrasted with the brilliant blue water and pure white splashes of waves crashing into the rocks, the complete picture is striking. I can’t make any guarantees for your Hawaii vacation, but from my own experiences, the sunsets I’ve viewed from China Walls always seem to be exponentially more amazing than from anywhere else on Oahu. Obviously, that’s a completely subjective opinion; but try it for yourself and see if you don’t agree. I don’t know why this location seems to be better than anywhere else for watching a sunset in Hawaii, but it isn’t bias on my part. It’s a mystery… a glorious mystery of nature. Even though there’s not a grain of sand to be found, you can hang-out at China Walls like you would for a day on the beach. Just lay out your towels or mats on any flat surface – as far from the water’s edge as possible. Don’t get suckered into laying everything out on the most obvious flat area near the water. If you do, there’s a good chance you’ll get washed away by a stray wave. If you’re very adept in the ocean (meaning you can swim well, tread water for as long as you need to, and handle yourself without panicking while waves try to thrash you on the rocks)… and if you’re able to climb wet, slippery rocks quickly… China Walls is a fun place to jump off the rocks and go for a swim. The jump itself is only approximately three meters/10 feet (like the high diving board at most swimming pools). 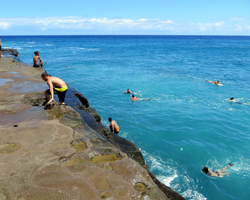 Then once you’re in the water, you can swim out past where the waves are breaking for some beautiful snorkeling. If you have a bodyboard or surfboard, you could also give wave-riding a try. It’s tricky, because you have to catch the wave within one or two meters of the rock wall and then ride parallel to the rocks with only a slight turn to the left (see photo at bottom of this page). Nevertheless, it’s fun (if you know what you’re doing). For a much higher cliff jump, you can go a couple blocks over to the Spitting Cave. Never stop paying attention to the waves when you’re on the wall at the water’s edge. An unexpected wave could easily climb up onto the ledge and knock you over. Or, as was my case… if you don’t climb out of the water quickly enough, a wave could grab you and drag you along the face of the wall. To this day, I still can’t figure out how or why I allowed myself to lose focus like that; but I did, and I had the cuts and bruises to show for it. I have purposely included photos of waves washing up onto the ledges just so you can visualize what I mean. Watch out for the wet rocks, which are often covered with brown algae. These spots are more slippery than ice! If at all possible, go around these hazards. Even if you try to be extremely cautious about foot placement and balance, the odds are against you. Again, I had the cuts and bruises to prove it. Disclaimer: I’m not recommending this Hawaii attraction. 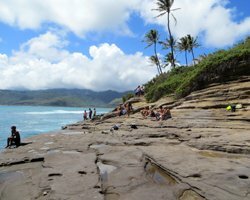 I’m simply giving you information about all Oahu tourism activities. The decision to experience anything I’ve described is your own. Use your brain and take responsibility for your own safety. Stupidity and carelessness can kill you. Know the limits of your ability and stay within them. Watch your children carefully at all times. 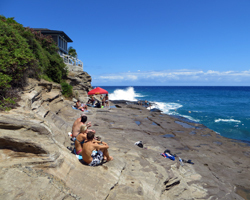 If you’re in the water near waves and/or rocks, pay attention to your surroundings and stay alert for hazards. Never turn your back to the waves. Use your sunscreen. Heed posted warning signs. 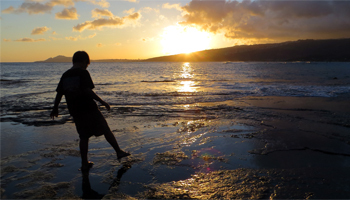 Be smart about how you enjoy your Hawaii vacation.